What started out to be a warm, December, Texas weekend turned into a chilly, but eventful hunting excursion at Escondido Ranch. Middle-of-the-week forecast promised 60s all the way through the weekend, but a northern front brought the temps down into the 40's. However, it could not have come at a better time. The animals seem to move better when day time temperatures stay below 50, and we had several trophy hunters coming to the ranch that weekend. A good friend of mine who is a regular visitor at Escondido Ranch put in a tall order for a trophy Fallow buck. I had been communicating with him earlier in the week about a mature, trophy Fallow deer that was spotted on several occasions during prior hunts. I sent him some pics of the deer. Once he saw them, he was convinced he was making the right selection. The scene was set and I knew I had my work cut out for me. Even though my friend knows a thing or two about hunting himself, he was counting on me to put him on this amazing Fallow deer buck during the upcoming three-day weekend. 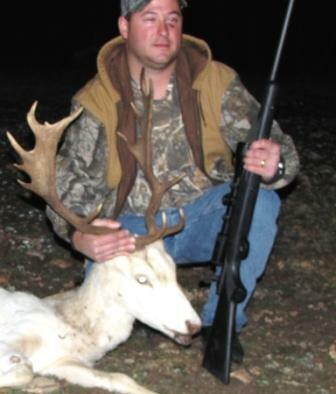 Hunting a specific animal, especially a unique deer like this one, requires several days of scouting and preparation. It was a tall order, but I was up for the challenge. We would sit in a tower blind that allows greater visibility on the back side of Escondido Ranch. We would get into a vehicle and drive around to see if the Fallow buck got careless and happened to be out grazing in an open field. We would walk-and-stalk along known trails to see if we can spot the Fallow from afar and get close for a shot. By the time Sunday evening rolled around, we exhausted all three options. We only had about 20 minutes of shooting light left when we decided to make a final pass by the area where we started our hunt, at the Buck Blind Pasture. This area offers ample cover for the cautious, mature bucks of all species, but is abundant with natural vegetation, keeping the big boys in the area. We were running out of light fast and were getting anxious to see the deer. As I walked down the road to peek around the corner I saw a white silhouette of a Fallow deer. I was not sure if it was the Fallow deer we were looking for, but when, after a few tense moments, he finally raised his head, there was little doubt. At that point we were at about 120 yards from the deer. I turned to my buddy and told him to "get ready to make a shot". The deer slowly moved into a clearing. The hunter took one last look and squeezed off the trigger, sending a bullet directly into the unsuspecting Fallow deer. Great shot! We did it!!! 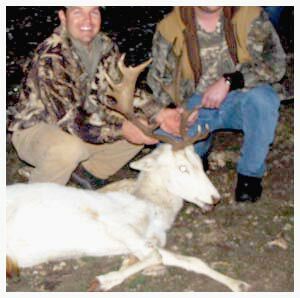 We managed to harvest an awesome, mature, white Fallow buck at Escondido Ranch. What a Trophy! What an experience! What an adventure! It doesn't always work out in such a timely fashion, but we were thrilled that it did. Happy hunters are what we strive for at Escondido Ranch. I am certain that we accomplished it that weekend. This particular weapon is a lot of fun. It’s light-weight, quiet sufficient for backyard use within the neighborhood, as well as correct. I wanted to note that the Gamo brand pellets match snug and shoot within tight groups. The Crossman pellets it shows everyone purchases are slightly free whenever put into the actual gun barrel as well as proceed everywhere in comparison Here.